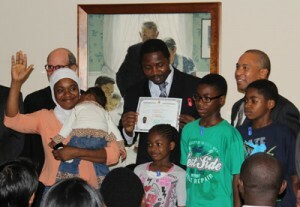 Stockbridge, MA, July 30, 2018 – Norman Rockwell Museum will partner with the Berkshire Immigrant Center to host their annual United States Citizenship Naturalization Ceremony on Friday, August 10th from 10 a.m. to 1 p.m. Now in its seventh year of being held at the Museum, the ceremony is for residents of Western Massachusetts who have immigrated to the United States from around the world. The special event will give members of the community the opportunity to welcome fellow residents, as they are sworn-in as new naturalized citizens of our country. Being held during the 75th anniversary of Norman Rockwell’s Four Freedoms, the ceremony serves as a timely and important reminder of the themes expressed in Franklin Delano Roosevelt’s original 1941 speech, which were illustrated two years later in Rockwell’s iconic paintings. Original Four Freedoms war bond posters will serve as an important backdrop for event. For the third year, the ceremony will be presided over by the Honorable Joan M. McMenemy, First Justice of Berkshire County Juvenile Court. Remarks are to be offered by Ms. Norton Moffatt and Brooke Mead, Executive Director of the Berkshire Immigrant Center. Color guard will be provided by the Williamstown American Legion Post 152, with singer Lina Orozco Grillon performing music during the event. This year’s ceremony is made possible with generous support from Berkshire Bank Foundation, and Helen Bing. Other local businesses who have generously donated items for the event and reception include Guido’s Fresh Marketplace, Big Y Foods, Inc., and other cultural institutions. Support for the event and the efforts of Berkshire Immigrant Center is encouraged, and can be arranged by contacting the Museum at 413.931.2221 or BIC at 413.445.4881. Priority seating is given to new citizens and their families; Museum visitors are welcome to observe the ceremony based on space availability. A reception will follow for new citizens and their families on the Museum’s terrace.